1. June is International Surf Music Month and National Accordion Awareness Month. 2. June 1 is National Go Barefoot Day. I hope it isn’t too cold. 3. Leave the Office Earlier on June 2. Yep. It’s National Leave the Office Earlier Day. 4. On June 4, say Happy Birthday to: Cecilia Bartoli (44), El DeBarge (49), Angelina Jolie (35), Michelle Phillips (65), Parker Stevenson (57), Dr. Ruth Westheimer (81), and Noah Wyle (39). 5. I wish that I could be in Collinsville, IL on June 5 for the Horseradish Festival. I love that stuff. 1. May 23 is World Turtle Day. Celebrate and protect the turtles of the world. 2. On May 24, say Happy Birthday to: Jim Broadbent (61), Tommy Chong (72), Bob Dylan (69), Alyson Hannigan (36), Patti LaBelle (66), Alfred Molina (57), Frank Oz (66), and Priscilla Presley (65). Centerville Library Now Has a Facebook Page! 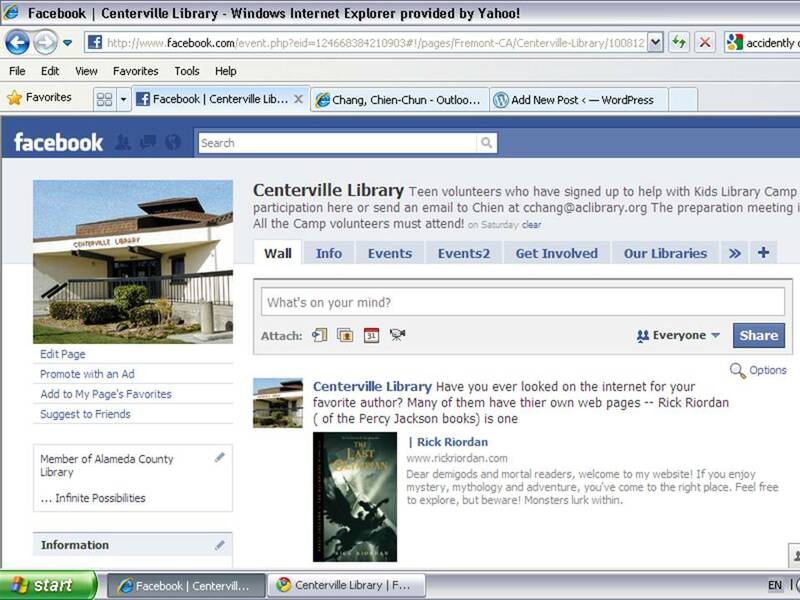 Whether you have a Facebook account or not, check out Centerville Library’s Facebook page! Besides the Alameda County Library’s website and this blog, we just added another way for you to get information and communicate with us online. Let’s get connected! 1. It’s International New Friends, Old Friends Week. 2. On May 16, say Happy Birthday to: David Boreanaz (39), Pierce Brosnan (57), Janet Jackson (44), and Olga Korbut (55). 3. May 18 is International Museum Day. What museum will you visit? 4. “I Need a Patch For That Day” falls on May 21. I’d like them to make a patch for bad hair days. What about you? 5. On May 22, 1856, Massachusetts senator Charles Sumner was attacked in the Senate Chamber by South Carolina congressman Preston Brooks. Missed the last episode of Grey’s Anatomy and forgot to set your DVR? Watch it on the Web! Join us as we demonstrate a few of the most popular sites to watch TV and movies for free (and legally) on the Internet. Ready to join the social networking world? Find out how to keep in touch with friends and family and learn what people are talking about when they talk about Facebook. Join us for a lecture/demonstration on how to create and use a Facebook account. Can’t make it to the library but need a book to read or have a paper to write? Want an audiobook for your trip but the library’s closed? Join us for a demonstration on how to use and download eBooks and eAudiobooks from the library’s website using your home computer.